The Chinese travelers of ancient India mentioned a number of educational institutions. The most famous among them were the Hinayana University of Valabhi and the Mahayana University of Nalanda. Hiuen Tsang gives a very valuable account of the Nalanda University. The Chinese travelers of ancient India mentioned a number of educational institutions. The most famous among them were the Hinayana University of Valabhi and the Mahayana University of Nalanda. Hiuen Tsang gives a very valuable account of the Nalanda University. The term Nalanda means 'giver of knowledge'. It was founded by Kumaragupta I during the Gupta period. It was patronised by his successors and later by Harsha. The professors of the University were called panditas. Some of its renowned professors were Dingnaga, Dharmapala, Sthiramati and Silabadhra. Dharmapala was a native of Kanchipuram and he became the head of the Nalanda University. 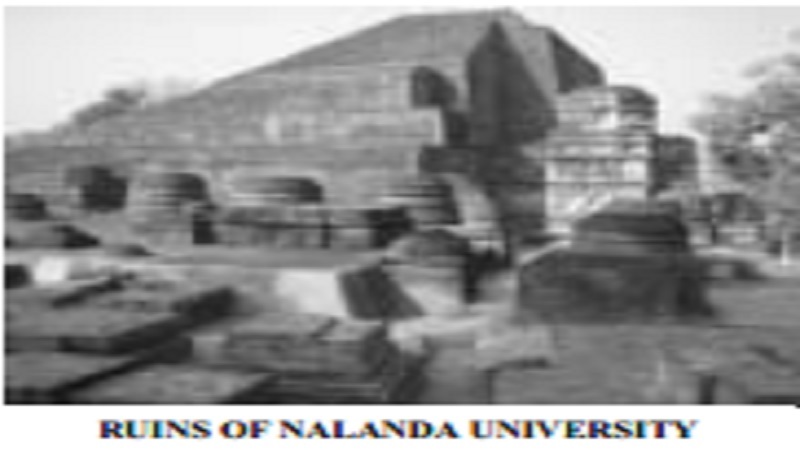 Nalanda University was a residential university and education was free including the boarding and lodging. It was maintained with the revenue derived from 100 to 200 villages endowed by different rulers. Though it was a Mahayana University, different religious subjects like the Vedas, Hinayana doctrine, Sankhya and Yoga philosophies were also taught. In addition to that, general subjects like logic, grammar, astronomy, medicine and art were in the syllabus. It attracted students not only from different parts of India but from different countries of the east. Admission was made by means of an entrance examination. The entrance test was so difficult that not more than thirty percent of the candidates were successful. Discipline was very strict. More than lectures, discussion played an important part and the medium of instruction was Sanskrit. Recent archeological excavations have brought to light the ruins of the Nalanda University. It shows the grandeur of this centre of learning and confirms the account given by the Chinese pilgrims. It had numerous classrooms and a hostel attached to it. According to Itsing, the Chinese pilgrim, there were 3000 students on its rolls. It had an observatory and a great library housed in three buildings. Its fame rests on the fact that it attracted scholars from various parts of the world. It was an institution of advanced learning and research.